"Bagworm" redirects here. 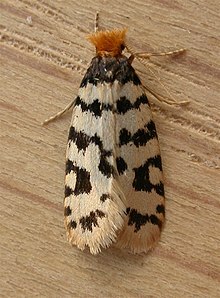 This may also refer to two Macrolepidoptera species, the fall webworm (Hyphantria cunea) or the eastern tent caterpillar (Malacosoma americanum). The Psychidae (bagworm moths, also simply bagworms or bagmoths) are a family of the Lepidoptera (butterflies and moths). The bagworm family is fairly small, with about 1350 species described. Bagworm species are found globally, with some, such as the snailcase bagworm (Apterona helicoidella), in modern times settling continents where they are not native. Another common name for the Psychidae is "case moths", but this is just as well used for the case-bearers (Coleophoridae). The names refer to the habits of caterpillar of these two families, which build small protective cases in which they can hide. The bagworms belong to the superfamily Tineoidea, which is a basal lineage of the Ditrysia just as the Gelechioidea, in which the case-bearers are placed. This means that the bagworms and case-bearers are only as closely related to each other as either is to butterflies (Rhopalocera). Most bagworms are inoffensive to humans and not at all conspicuous; some are occasional nuisance pests. However, a few species can become more serious pests, and have caused significant damage e.g. to wattle (Acacia mearnsii) in South Africa and orange (Citrus × sinensis) in Florida. If detected early, picking the cases from the trees while in their pupa stage is an effective way to check an infestation; otherwise, insecticides are used. One bagworm species, the fangalabola (Deborrea malgassa) of Madagascar, is in some places encouraged to breed on wattle trees, because its pupae are collected as a protein-rich food. Bagworm (possibly Hyalarcta huebneri) extending its forequarters from its case in the act of locomotion. The caterpillar larvae of the Psychidae construct cases out of silk and environmental materials such as sand, soil, lichen, or plant materials. These cases are attached to rocks, trees or fences while resting or during their pupa stage, but are otherwise mobile. The larvae of some species eat lichen, while others prefer green leaves. In many species, the adult females lack wings and are therefore difficult to identify accurately. 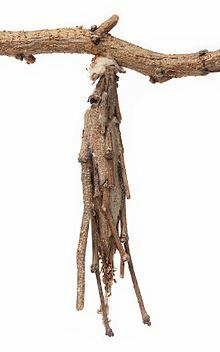 Case-bearer cases are usually much smaller, flimsier, and consist mainly of silk, while bagworm "bags" resemble caddisfly cases in their outward appearance – a mass of (mainly) plant detritus spun together with silk on the inside. Bagworm cases range in size from less than 1 cm to 15 cm among some tropical species. Each species makes a case particular to its species, making the case more useful to identify the species than the creature itself. Cases among the more primitive species are flat. More specialized species exhibit a greater variety of case size, shape, and composition, usually narrowing on both ends. The attachment substance used to affix the bag to host plant, or structure, can be very strong, and in some case require a great deal of force to remove given the relative size and weight of the actual "bag" structure itself. Body markings are rare. Adult females of many bagworm species have only vestigial wings, legs, and mouthparts. In some species, parthenogenesis is known. The adult males of most species are strong fliers with well-developed wings and feathery antennae but survive only long enough to reproduce due to underdeveloped mouthparts that prevent them from feeding. Their wings have few of the scales characteristic of most moths, instead having a thin covering of hairs. In the larval stage, bagworms extend their head and thorax from their mobile case to devour the leaves of host plants, often leading to the death of their hosts. Trees infested with bagworms exhibit increasingly damaged foliage as the infestation increases until the leaves are stripped bare. Some bagworms are specialized in their host plants (monophagous), while others can feed on a variety of plant species (polyphagous). A few species also consume small arthropods (such as the camphor scale Pseudaonidia duplex, a scale insect). Since bagworm cases are composed of silk and the materials from their habitat, they are naturally camouflaged from predators. Predators include birds and other insects. Birds often eat the egg-laden bodies of female bagworms after they have died. Since the eggs are very hard-shelled, they can pass through the bird's digestive system unharmed, promoting the spread of the species over wide areas. A bagworm begins to build its case as soon as it hatches. Once the case is built, only adult males ever leave the case, never to return, when they take flight to find a mate. Bagworms add material to the front of the case as they grow, excreting waste materials through the opening in the back of the case. When satiated with leaves, a bagworm caterpillar secures its case and pupates. The adult female, which is wingless, either emerges from the case long enough for breeding or remains in the case while the male extends his abdomen into the female's case to breed. Females lay their eggs in their case and die. The female evergreen bagworm (Thyridopteryx ephemeraeformis) dies without laying eggs, and the larval bagworm offspring emerge from the parent's body. Some bagworm species are parthenogenetic, meaning their eggs develop without male fertilization. Each bagworm generation lives just long enough as adults to mate and reproduce in their annual cycle. Ten subfamilies and about 240 genera are recognized among the bagworms. Bagworm larva in the Negev (April 2014). Case is made mostly of feathery stork's bill seeds (Erodium cicutarium). ^ "Animal biodiversity: An outline of higher-level classification and survey of taxonomic richness - Lepidoptera" (PDF). ^ Sobczyk, T. 2011. Psychidae. World Catalogue of Insects 10. Apollo Books Stenstrup, 467 pp. ^ Resh, Vincent; Cardé, Ring. Encyclopedia of Insects. Burlington: Elsevier Science. p. 197. ^ Nieukerken, E. J. van, L. Kaila, I. J. Kitching, N. P. Kristensen, D. C. Lees, J. Minet, C. Mitter, M. Mutanen, J. C. Regier, T. J. Simonsen, N. Wahlberg, S.-H. Yen, R. Zahiri, D. Adamski, J. Baixeras, D. Bartsch, B. Å. Bengtsson, J. W. Brown, S. R. Bicheli, D. R. Davis, J. de Prins, W. de Prins, M. E. Epstein, P. Gentili-Poole, C. Gielis, P. Hättenschwiler, A. Hausmann, J. D. Holloway, A. Kallies, O. Karsholt, A. Y. Kawahara, S. (J.C.) Koster, M. V. Kozlov, J. D. Lafontaine, G. Lanas, J.-F. Landry, S. Lee, M. Nuss, K.-T. Park, C. Penz, J. Rota, A. Schintlmeister, B. C. Schmidt, J.-C. Sohn, M. A. Solis, G. M. Tarmann, A. D. Warren, S. Weller, R. V. Yakovlec, V. V. Zolotuhin, A. Zwick. 2011. Order Lepidoptera Linnaeus, 1758. In: Zhang, Z.-Q. (Ed.) Animal biodiversity: An outline of higher-level classification and survey of taxonomic richness. – Zootaxa 3148: 1–237. Wikimedia Commons has media related to Psychidae. Bagworm, Fall Webworm or Eastern Tent Caterpillar?, August 18, 2001. Sandra Mason, University of Illinois Extension. Accessed May 31, 2010. This page was last edited on 11 April 2019, at 20:48 (UTC).